Leesburg’s Kip Tom Confirmed As UN Ag Ambassador, Rep.
Kip Tom testifies before the Senate Foreign Relations Committee in September. The committee unanimously advanced his nomination to the full Senate where it was confirmed this week. 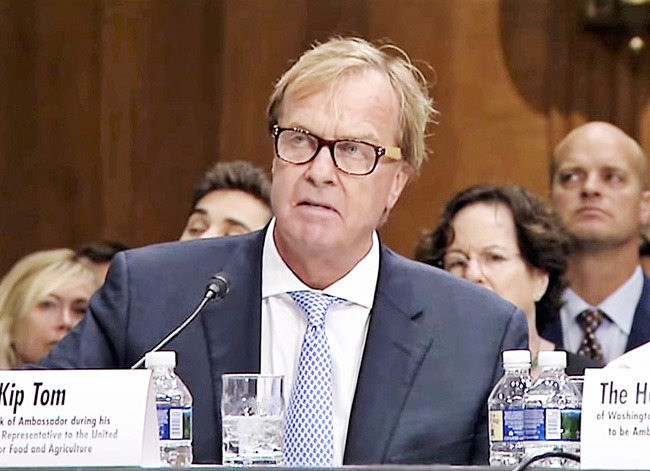 It took a year and nearly nine months, but local agri-businessman Kip Tom was confirmed as ambassador and U.S. representative to the United Nations Agencies for Food and Agriculture by the full Senate Thursday evening. Tom said Friday evening he was looking forward to getting started. Tom will be sworn in at the beginning of next week and will be headed to Rome shortly afterward. He will be in charge of U.S. dollars and how they’re spent among several United Nations food-related organizations. The biggest of those are the World Food Program, which provides emergency food relief; the Food and Agriculture Organization, the equivalent of an international USDA; and the International Fund for Agriculture Development, which works with the International Bank to fund programs to increase food production. The U.S. is the biggest funder of the UNAFA, with its $3 billion annual assessment based on GDP. But Tom says another $2 billion in voluntary dollars is also provided by the U.S., with another $2 billion from U.S. entities like the Gates Foundation. “We are clearly the best actor when it come to solving international food crises,” he said.U.S. Sen. Todd Young, R-Ind., issued a statement Friday congratulating Tom, of Leesburg, on being confirmed to serve as ambassador and U.S. representative to the United Nations Agencies for Food and Agriculture in Rome, Italy. As chairman of the Senate Foreign Relations Subcommittee that oversees the United Nations and its agencies, Young recommended Tom for the appointment in 2017. When his nomination was announced by the White House in July 2018, Tom received bipartisan support from both Indiana senators. Young also introduced Tom during his first confirmation hearing before the Senate Foreign Relations Committee last summer. He was unanimously voted out of the Senate Foreign Relations Committee twice before his final confirmation by the full Senate last night.